Kirchen offers a rare combination of guitar virtuosity, a mastery of roots rock ’n’ roll, and an almost magical connection with his audience. Finally with Seeds and Stems, due out on Proper Records on June 18, 2013, he has an album that captures all of this. One of those reinvented songs is a Kirchen classic “Womb to the Tomb.” Originally a fast-paced dieselbilly rocker, the new version is slower and bluesier with a gravelly, pounding beat well suited to tell the tale of a lonely trucker’s brush with the supernatural. Kirchen conceived the changes through an immersion in Louisiana culture that came about when he was teaching an Early Country Music class at Augusta Heritage Center that happened to coincide with their Cajun and Zydeco week. “It’s a ghost trucker song set on I-10, which runs right through the bayou. Because I’m an outsider I didn’t want to just shove an accordion on it, so I tried for the aura of Louisiana.” And he succeeds: in this new arrangement you can almost feel the steam rising up from the asphalt. The opening track, a rocked-up “Too Much Fun,” is a Kirchen favorite from his early days as singer and lead guitarist for Commander Cody and His Lost Planet Airmen. It was one of the very first songs he ever wrote, with fellow Airman Billy C. Farlow. “It was my first real success as a songwriter, and I called my own band that for years. It’s still a good song,” says Kirchen, a master of the understatement. Another track from the early Cody days is “Semi-Truck,” also written by Kirchen and Farlow. The complete title, “Here I Sit, All Alone With a Broken Heart, I Took Three Bennies and My Semi-Truck Won’t Start” is proof that, aside from pioneering new connections between the worlds of rock, folk, boogie-woogie, swing and country, the Cody band had another unique aspect for their time: a sense of humor. “We had a humorous component,” says Kirchen, “but it wasn’t too arch, it wasn’t smirky. We were playing the hard-core stuff, and we aware of its irony with a supreme affection for it. The people who wrote that stuff — they had perspective too. I’m not the first to notice that these cornball tear-jerking songs are not only cornball and tear-jerky, they are also fabulous.” The title cut, “Down to Seeds and Stems Again,” by Commander George Frayne and Farlow, is surely in the running for the saddest country song ever written. Kirchen’s delivery is up to the task at hand. Kirchen’s Cody days began in 1967 when he co-founded Commander Cody and His Lost Planet Airmen. They recorded seven albums for Paramount and Warner Brothers, one of which (Live From Deep in the Heart of Texas) rightfully made Rolling Stone’s list of the “100 Best Albums of All Time.” The original band established its place in the infancy of the Americana movement by being one of the first and only rock ’n’ roll bands to infuse their honky-tonk sound with pure, blood-and-guts country roots and Western swing. It’s Kirchen’s indelible guitar licks that define their top-ten charting hit, “Hot Rod Lincoln,” a song that eventually took on a post-Cody life of its own. Before Bill Kirchen ever picked up a Telecaster he was a classical trombonist. That’s what he was studying as a teenager at Interlochen Center for the Arts in the early ’60s when he first fell for the guitar, in part due to the blossoming “folk scare” [his words] and in part thanks to his guitar-playing cabin counselor, Dave Siglin (founder of The Ark in Bill’s hometown Ann Arbor, Michigan). Just turned 16, Bill rescued his mom’s old banjo from the attic, got a copy of Pete Seeger’s How to Play the 5-String Banjo book and hitch-hiked to the 1964 Newport Folk Festival. Kirchen: “I witnessed stuff that knocked me out — Lightnin’ Hopkins, the Kweskin Jug Band, Son House, Johnny Cash, the Staples Singers, my original guitar hero Mississippi John Hurt. The top of my head flipped open and it’s never shut.” He’d head for New York when he could, hanging out in the Village and letting the whole scene wash over him. When he went back to Newport in ’65 and saw Dylan go electric, then on to New York City to see the Lovin’ Spoonful at the Night Owl, it “ruined me for normal work.” His strikingly powerful Dylan covers are staples of the live show to this day, and this CD includes “It Takes a Lot to Laugh, It Takes a Train to Cry,” perhaps the most moving and sublime of the bunch. After the California-based Cody band split, Kirchen started his own band, The Moonlighters, and cut two more albums before relocating to DC in the mid-’80s. There he started his Too Much Fun trio, released ten more critically-acclaimed albums and began his robust touring schedule of 200-plus dates a year around the country and as far afield as Lapland, Israel and Palestine. 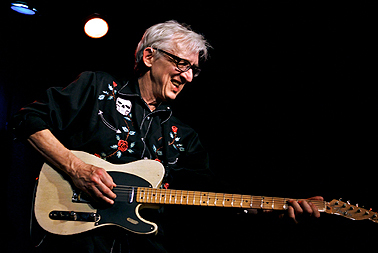 In 2001, Kirchen received a Grammy nomination for his instrumental “Poultry in Motion.” The following year he was inducted into the Washington Area Music Association Hall of Fame, neatly sandwiched between John Phillip Sousa and Dave Grohl. He has played and recorded with a long list of luminaries, including Nick Lowe, Doug Sahm, Elvis Costello, Link Wray, Emmylou Harris, Hoyt Axton and Gene Vincent. Bill is pretty sure that he is the only person to have, in a single year, stood on stage and played with both Ralph Stanley and Elvis Costello. Now living in Austin, Kirchen maintains his rigorous and far-reaching tour schedule and also teaches at Augusta Heritage Center, Centrum Voiceworks and Jorma Kaukonen’s Fur Peace Ranch. Jorma was called in to fingerpick on the new release’s bonus track, the song that asks the musical question, “Are You Talkin’ About Love or Are You Talkin’ About Chicken?” It’s practically a true story written by Bill and Louise Kirchen and Sarah Brown, and inspired by their dog Rufus. 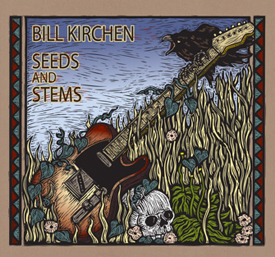 Bill Kirchen’s latest, Seeds and Stems, takes a fresh approach to many of the songs that were planted at the beginning of an incredibly full career, songs that grew into classics and branched out across the variegated styles of Americana and roots rock ’n’ roll.